Portfolio Categories: Pottery and Servingware. Over 25 years ago Nancy’s children gave her a gift of pottery classes and she has been making pots ever since. She was a studio potter at Creative Arts Workshop in New Haven for much of that time but have since given that up to spend more time in her own studio. Nancy uses stoneware and porcelain fired to cone 6 (2200 F) in an electric kiln. 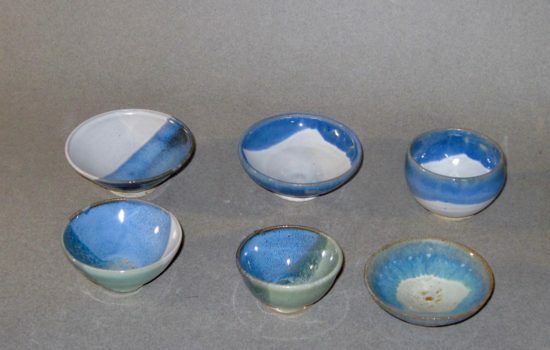 She makes all of her own glazes and likes to experiment with different glaze combinations. She loves the versatility of clay. Nancy’s work may be thrown, hand built of a combination of the two. She uses texture, slips and glazes to achieve a desired look. Nancy continues to learn and explore by taking workshops; including a Women Working with Clay Symposium at Hollins University. She has also attended workshops with Jennifer McCurdy, Tom Coleman, Hayne Bayless, Jeff Oestreich, Nick Joerling and John Townley. Although She leans toward functional work Nancy tries to inject a decorative and playful feeling. She teaches a hand building class at Gallery 53 in Meriden.